Y.V. Kovchegov, D. Pitonyak and M.D. Sievert, Helicity evolution at small x, JHEP 01 (2016) 072 [Erratum JHEP 10 (2016) 148] [arXiv:1511.06737] [INSPIRE]. Y.V. Kovchegov and M.D. Sievert, Small-x Helicity Evolution: an Operator Treatment, arXiv:1808.09010 [INSPIRE]. X.-d. Ji, Gauge-Invariant Decomposition of Nucleon Spin, Phys. Rev. Lett. 78 (1997) 610 [hep-ph/9603249] [INSPIRE]. S. Bashinsky and R.L. Jaffe, Quark and gluon orbital angular momentum and spin in hard processes, Nucl. Phys. B 536 (1998) 303 [hep-ph/9804397] [INSPIRE]. P. Hagler and A. Schafer, Evolution equations for higher moments of angular momentum distributions, Phys. Lett. B 430 (1998) 179 [hep-ph/9802362] [INSPIRE]. A. Harindranath and R. Kundu, On Orbital angular momentum in deep inelastic scattering, Phys. Rev. D 59 (1999) 116013 [hep-ph/9802406] [INSPIRE]. O. Martin, P. Hagler and A. Schafer, Numerical solution of the evolution equation for orbital angular momentum of partons in the nucleon, Phys. Lett. B 448 (1999) 99 [hep-ph/9810474] [INSPIRE]. I.I. Balitsky, Operator expansion for high-energy scattering, Nucl. Phys. B 463 (1996) 99 [hep-ph/9509348] [INSPIRE]. I.I. Balitsky, Factorization and high-energy effective action, Phys. Rev. D 60 (1999) 014020 [hep-ph/9812311] [INSPIRE]. Y.V. Kovchegov, Small-x F 2 structure function of a nucleus including multiple Pomeron exchanges, Phys. Rev. D 60 (1999) 034008 [hep-ph/9901281] [INSPIRE]. Y.V. Kovchegov, Unitarization of the BFKL Pomeron on a nucleus, Phys. Rev. D 61 (2000) 074018 [hep-ph/9905214] [INSPIRE]. J. Jalilian-Marian, A. Kovner and H. Weigert, The Wilson renormalization group for low x physics: Gluon evolution at finite parton density, Phys. Rev. D 59 (1998) 014015 [hep-ph/9709432] [INSPIRE]. J. Jalilian-Marian, A. Kovner, A. Leonidov and H. Weigert, The Wilson renormalization group for low x physics: Towards the high density regime, Phys. Rev. D 59 (1998) 014014 [hep-ph/9706377] [INSPIRE]. E. Iancu, A. Leonidov and L.D. McLerran, The Renormalization group equation for the color glass condensate, Phys. Lett. B 510 (2001) 133 [hep-ph/0102009] [INSPIRE]. E. Iancu, A. Leonidov and L.D. McLerran, Nonlinear gluon evolution in the color glass condensate. 1., Nucl. Phys. A 692 (2001) 583 [hep-ph/0011241] [INSPIRE]. S. Griffiths and D.A. Ross, Studying the perturbative Reggeon, Eur. Phys. J. C 12 (2000) 277 [hep-ph/9906550] [INSPIRE]. K. Itakura, Y.V. Kovchegov, L. McLerran and D. Teaney, Baryon stopping and valence quark distribution at small x, Nucl. Phys. A 730 (2004) 160 [hep-ph/0305332] [INSPIRE]. J. Bartels and M. Lublinsky, Quark anti-quark exchange in γ * γ * scattering, JHEP 09 (2003) 076 [hep-ph/0308181] [INSPIRE]. J. Bartels, B.I. Ermolaev and M.G. Ryskin, Nonsinglet contributions to the structure function g 1 at small-x, Z. Phys. C 70 (1996) 273 [hep-ph/9507271] [INSPIRE]. J. Bartels, B.I. Ermolaev and M.G. Ryskin, Flavor singlet contribution to the structure function g 1 at small-x, Z. Phys. C 72 (1996) 627 [hep-ph/9603204] [INSPIRE]. A.V. Belitsky, X.-d. Ji and F. Yuan, Quark imaging in the proton via quantum phase space distributions, Phys. Rev. D 69 (2004) 074014 [hep-ph/0307383] [INSPIRE]. P.J. Mulders and R.D. Tangerman, The complete tree-level result up to order 1/Q for polarized deep-inelastic leptoproduction, Nucl. Phys. B 461 (1996) 197 [Erratum ibid. B 484 (1997) 538] [hep-ph/9510301] [INSPIRE]. 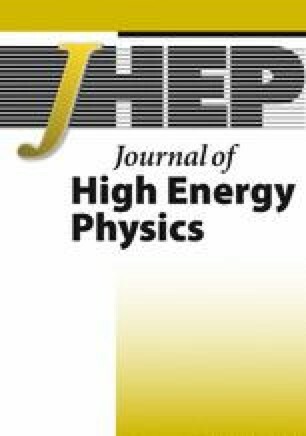 E. Iancu and R. Venugopalan, The Color glass condensate and high-energy scattering in QCD, in Quark-Gluon Plasma 3, R.C. Hwa and X.-N. Wang eds., World Scientific (2004), pp. 249–363 [hep-ph/0303204] [INSPIRE]. H. Weigert, Evolution at small x bj : The Color glass condensate, Prog. Part. Nucl. Phys. 55 (2005) 461 [hep-ph/0501087] [INSPIRE]. J. Jalilian-Marian and Y.V. Kovchegov, Saturation physics and deuteron-Gold collisions at RHIC, Prog. Part. Nucl. Phys. 56 (2006) 104 [hep-ph/0505052] [INSPIRE]. Y.V. Kovchegov and M.D. Sievert, Valence Quark Transversity at Small x, arXiv:1808.10354 [INSPIRE]. A.H. Mueller and S. Munier, p ⊥ -broadening and production processes versus dipole/quadrupole amplitudes at next-to-leading order, Nucl. Phys. A 893 (2012) 43 [arXiv:1206.1333] [INSPIRE]. L.D. McLerran and R. Venugopalan, Computing quark and gluon distribution functions for very large nuclei, Phys. Rev. D 49 (1994) 2233 [hep-ph/9309289] [INSPIRE]. L.D. McLerran and R. Venugopalan, Gluon distribution functions for very large nuclei at small transverse momentum, Phys. Rev. D 49 (1994) 3352 [hep-ph/9311205] [INSPIRE]. L.D. McLerran and R. Venugopalan, Green’s functions in the color field of a large nucleus, Phys. Rev. D 50 (1994) 2225 [hep-ph/9402335] [INSPIRE]. 1.Department of PhysicsThe Ohio State UniversityColumbusU.S.A.